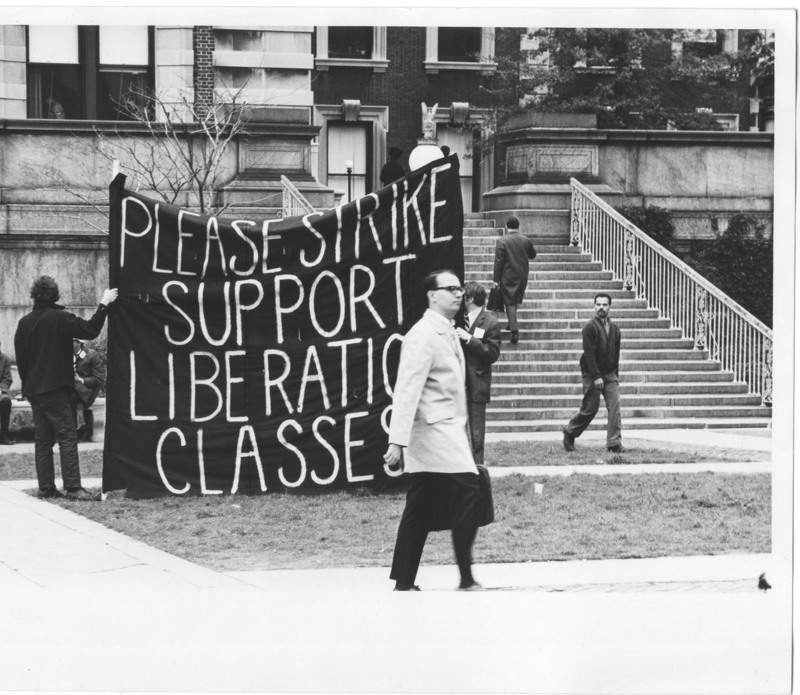 "Please Strike, Support Liberation Classes." Following the police bust of April 30, the Strike Coordinating Committee called for a student-faculty strike and the firing of President Kirk and Provost Truman. The University suspended classes for a week after the events of April 30; the ensuing strike, however, lasted through the end of the spring term. 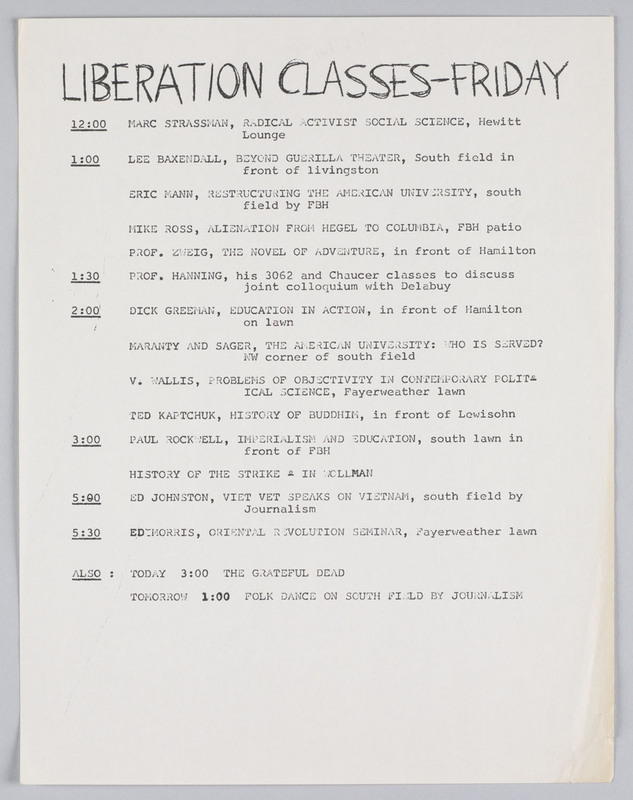 Circular: "Liberation Classes - Friday May 3, 1968." Schedule of liberation classes held around campus during the post-bust strike. 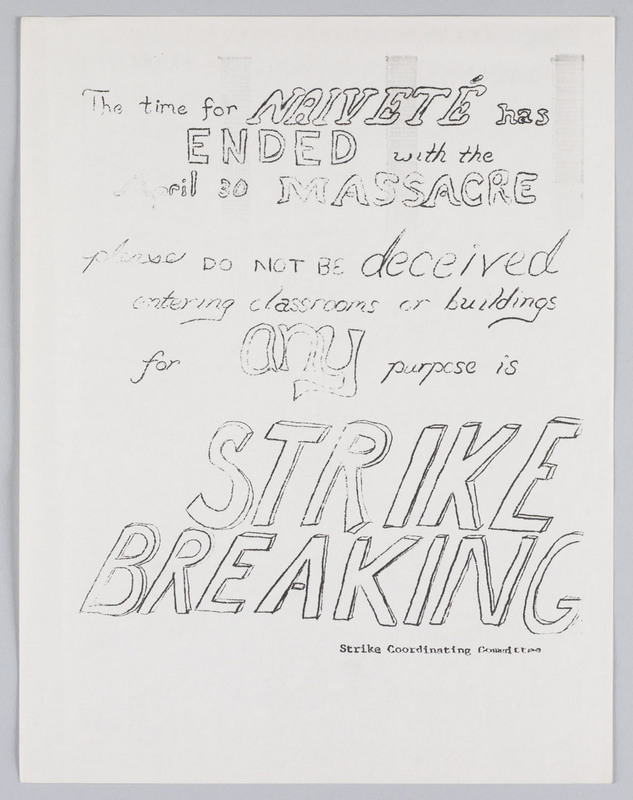 On May 2, the Strike Coordinating Committee created a Strike Education Committee (SEC) in response to what they saw as the failure of the “old Administration” to ensure a “free and democratic, creative and relevant educational institution.” The Strike Education Committee created and coordinated an alternative “Liberation School” that offered “counter-classes” to replace those being boycotted. Guidelines for “counter-classes” or “liberation classes” emphasized the importance of democratic participation. The committee also encouraged participants to focus on issues and themes not addressed by the mainstream Columbia curriculum. Keeping students, both undergraduate and graduate, from attending official Columbia classes remained one of the SEC’s central goals throughout May 1968. Circular: "The Time for Naiveté has Ended with the April 30 Massacre." 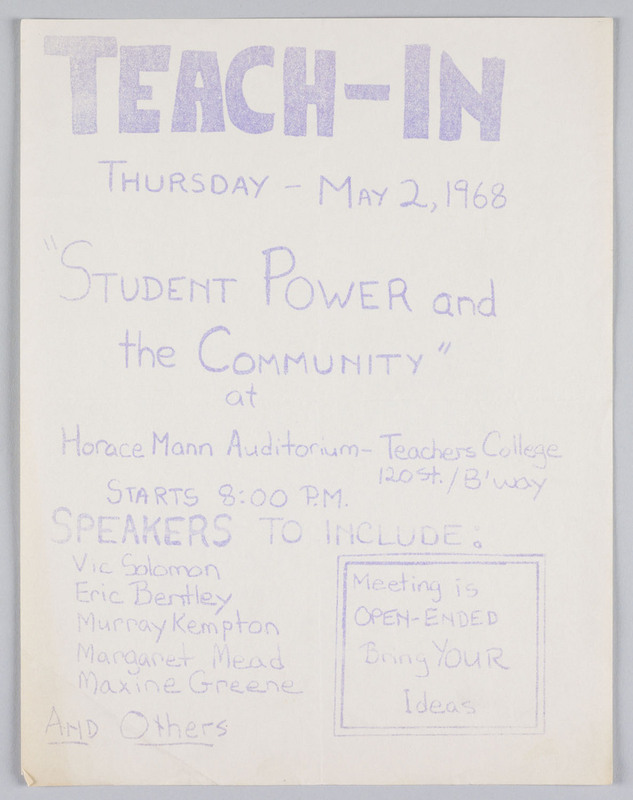 Circular: "Teach-In Thursday May 2, 1968." Events on campus during the post-bust strike often included sympathetic faculty such as Margaret Mead. Circular: Strike! 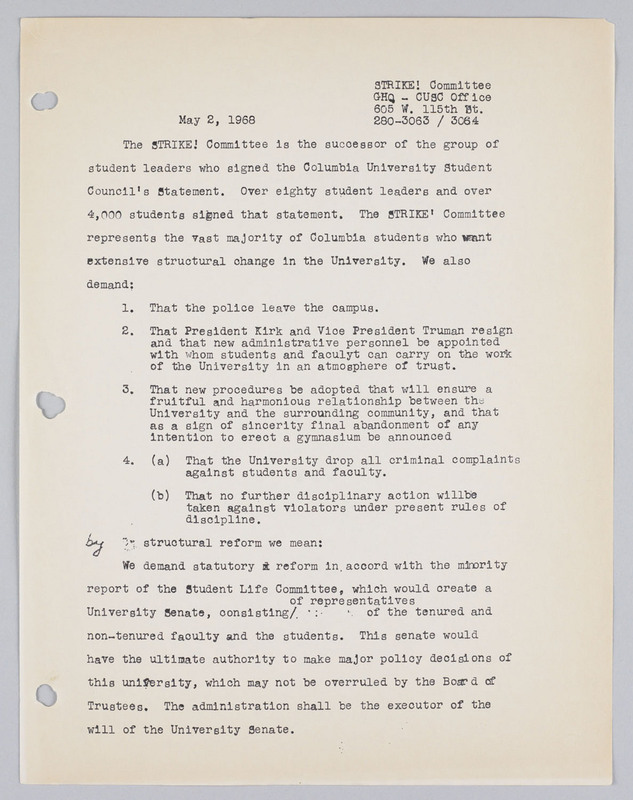 Committee Demands, May 2, 1968. After the early morning police bust, students met in Wollman Auditorium, called for a general strike, and demanded University restructuring – including the resignation of President Kirk and Provost Truman. 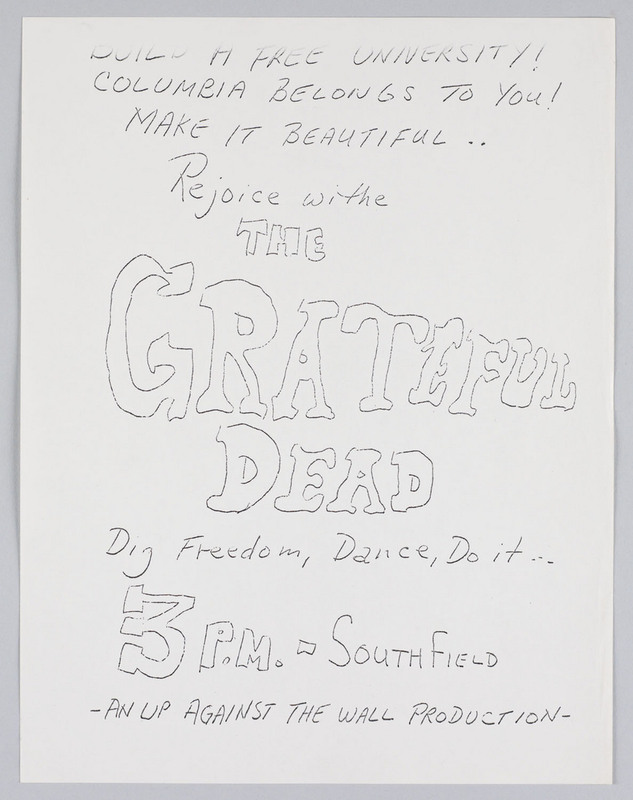 Circular: "Rejoice with the Grateful Dead." Click on this image to view the entire article. 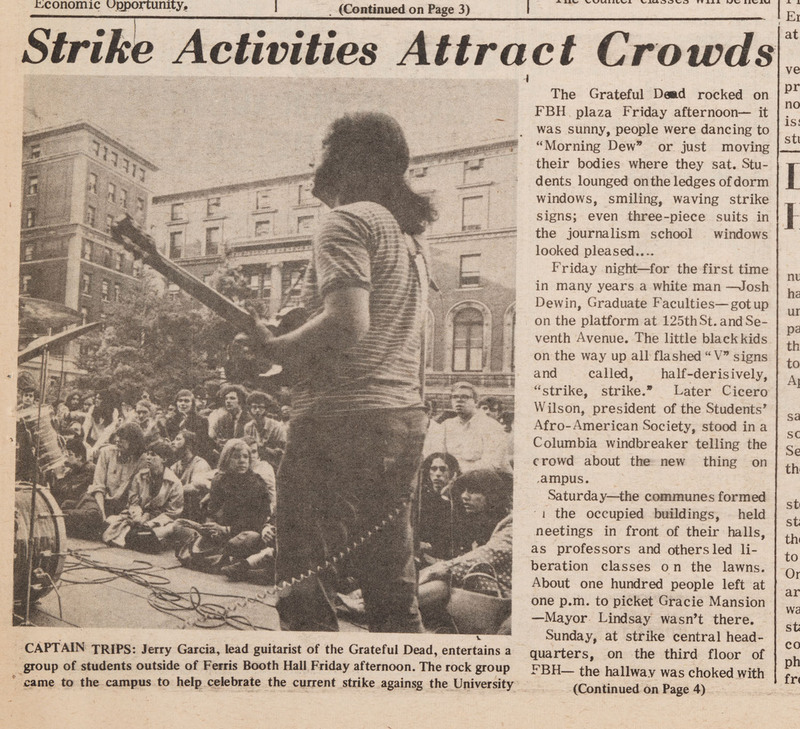 Columbia Daily Spectator Article: "Strike Activities Attract Crowds," May 6, 1968.